Shelter Logic realizes that when it comes to outdoor cover that there is a great deal more than simply setting up just the right canopy accessories. As a result, they make it their priority to develop top of the line products to insure that all of their customers are able to walk away with just what they need. 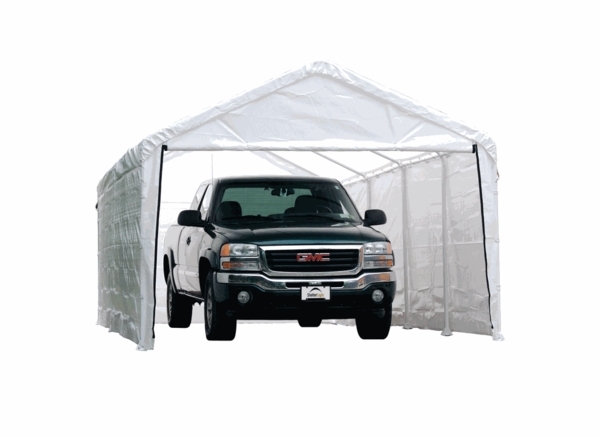 With the White Enclosure Kit for 12 foot by 26 foot Canopy, you have the ideal accessories to make sure that all of your outdoor activities go off according to plan. what are the color options, white will not work for me looking for a silver, or green, the shelter will be used for my boat on a lake, during the summer and winter, winds can get up to 50 mph, for thunder storms and winter storms. This unit is only offered in white and does not have a wind rating. How tall is the door opening on this enclosure kit? The door for this enclosure kit is 12 feet wide by 6 foot 3 inches high. Are the front and rear panels removable? What material is the cover? What holds the canopy to the frame? The front and rear panels are individual items and can indeed be removed. The material is a polyethylene based product, similar to the look and feel of a heavy tarp. The canopy top is held to the frame via elastic loops that hook back to themselves. Please be aware that this is the enclosure kit only. The full canopy is the ShelterLogic 12 x 26 Super Max Commercial Grade 10 Leg Canopy Shelter. What are the dimensions of the door opening? Trying to determine if our boat would fit through. If not, is it possible to only attach the side walls and back wall, leaving the front open? The door for this enclosure kit is 12 feet wide by 6 foot 3 inches high. If this opening is not tall enough, you can leave the front door off of the enclosure kit. Do please note this is an enclosure kit only for an existing ShelterLogic brand 12 x 26 Super Max canopy. The door will roll up to create about a 6'-6" tall door. For reference, the top ridge of the canopy is about 9'-4" tall. The zippered door opening is 125" wide. How much load can the canopy hold? We can have some heavy snows. This is the enclosure kit only for a 12 x 26 Super Max Canopy, so it would not have a snow load rating. The 12 x 26 Super Max itself does not have a snow load rating, either, and the manufacturer recommends that you keep the canopy free of snow. You may be interested in the Shelterlogic 12 x 25 x 11 ShelterTube Snow Load Rated Shelter, which does have a snow load rating of up to 43 pounds per square foot when properly deployed and anchored. Does this come with the structure as well, or is it just the canopy? It is the enclosure kit only for the Shelter Logic 12 x 26 SuperMax Commercial Grade 10 Leg Canopy Shelter. We are looking at the ShelterLogic White Enclosure Kit for a 12 x 26 Canopy. What is the height of this in the center? It would be the same height as the canopy itself, which is 9 feet 6 inches. What is this canopy's peak height? This item is an enclosure kit for the Shelter Logic 12 x 26 Super Max Commercial Grade 10 Leg Canopy Shelter. That shelter has a peak height of 9 feet 6 inches. Fast delivery easy to put together, great for weekend mechanic like me.